↑ Olsen, Patricia R.; Remsik, Jim (19 September 2009). "For Writing Software, a Buddy System". The New York Times. ↑ Cirillo, Francesco. 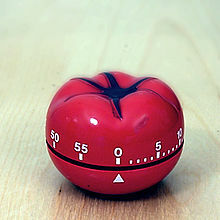 The Pomodoro Technique. ↑ Nöteberg, Staffan. Pomodoro Technique Illustrated. Raleigh, N.C: Pragmatic Bookshelf. ISBN 978-1-934356-50-0. ↑ Kaufman, Josh (2011). The Personal MBA: A World-Class Business Education in a Single Volume. Penguin UK. ISBN 978-0-14-197109-4.